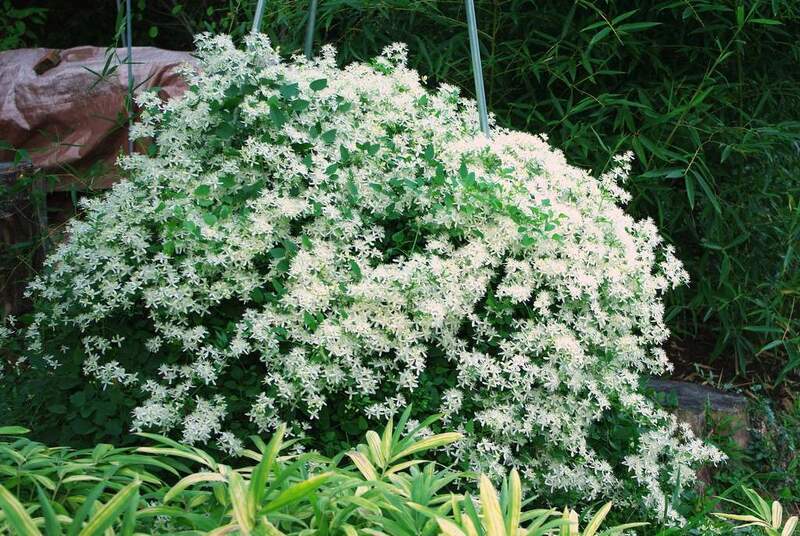 It's that time of year when that unassuming green vine that's been growing over your shrubs, mailbox, or trellis really puts on a show and explodes with small white flowers. 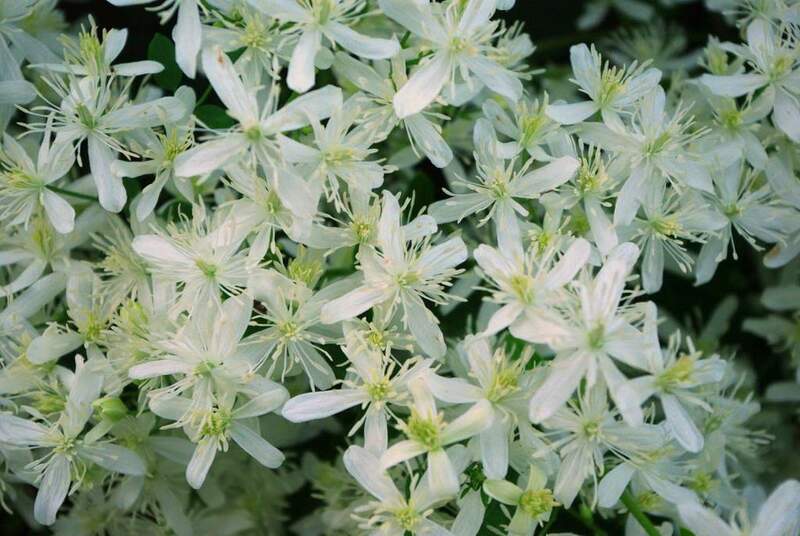 Although considered to be invasive in some areas of the country, Sweet Autumn Clematis, (Clematis terniflora) is a fast-growing perennial vine that makes a beautiful addition to the Fall garden. 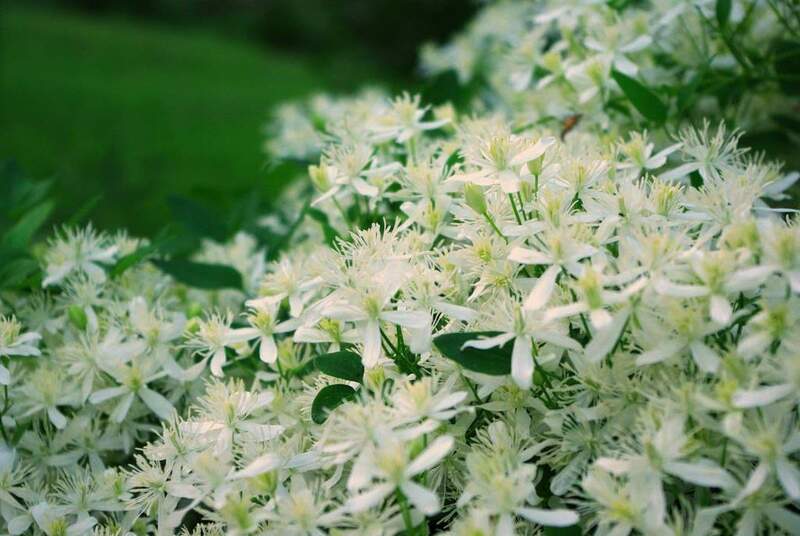 This plant originated in Japan, and is quite similar to the North American native Clematis virginiana. The way to tell them apart though is that the native plant has leaves that are lobed, while the non-native terniflora has rounded leaves. I didn't plant this -- it just grew here one year, and I've let it stay. I love the flowers, and their fragrance is quite nice. 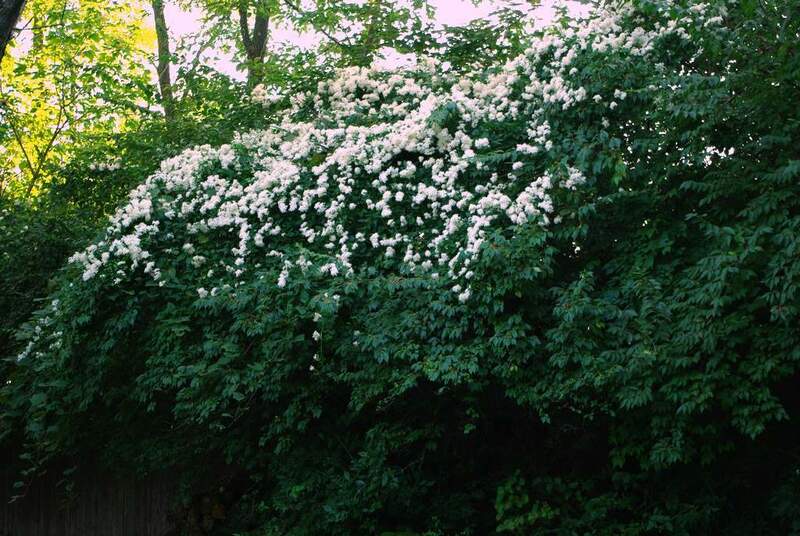 It's climbing over the much-hated bush honeysuckle, and really stands out in this shady yard. 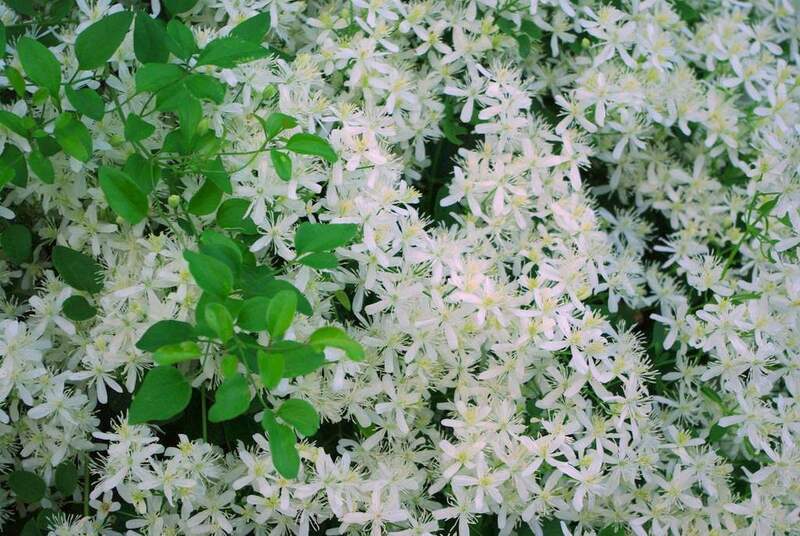 My neighbor noticed the fragrance before she saw the blooms, but I saw the blooms from across the street. The blanket of white is hard to miss! She didn't plant this, but I think is happy it's found a place in her yard. I'm not sure if this was planted here or not, but you can see how vigorous it is. I don't think this plant gets pruned back in the spring, and is really quite large -- probably too big. 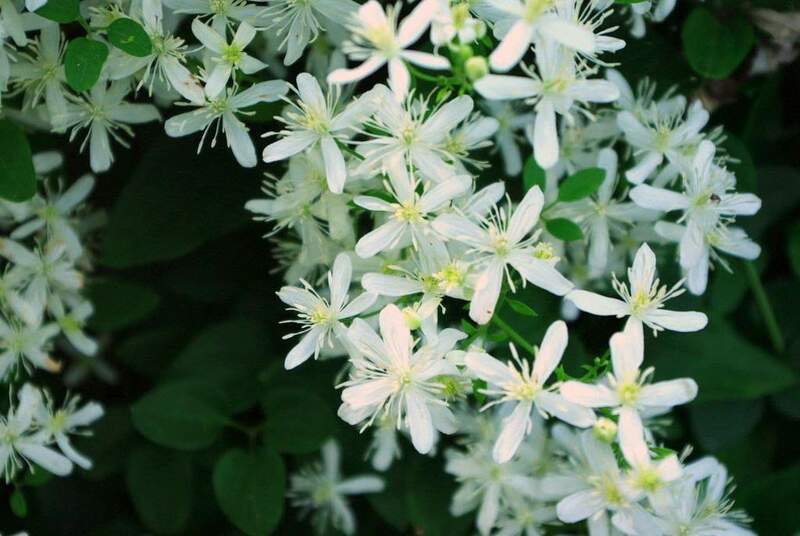 Since this plant blooms on "new wood", you can cut it back virtually to the ground each year and it will come back strong and bloom as if nothing ever happened. Next year I definitely need to give the plant more help in climbing the trellis. Maybe some chicken wire would help. I intended on doing that this year but never got around to it. Then the deer helped out with some pruning. End result is that I have a 4' tall mound of flowers instead of a 10' tall tower. Something to look forward to next year, right? I would much rather have the native version of this vine growing in my yard, but I'm quite happy with this imported species. 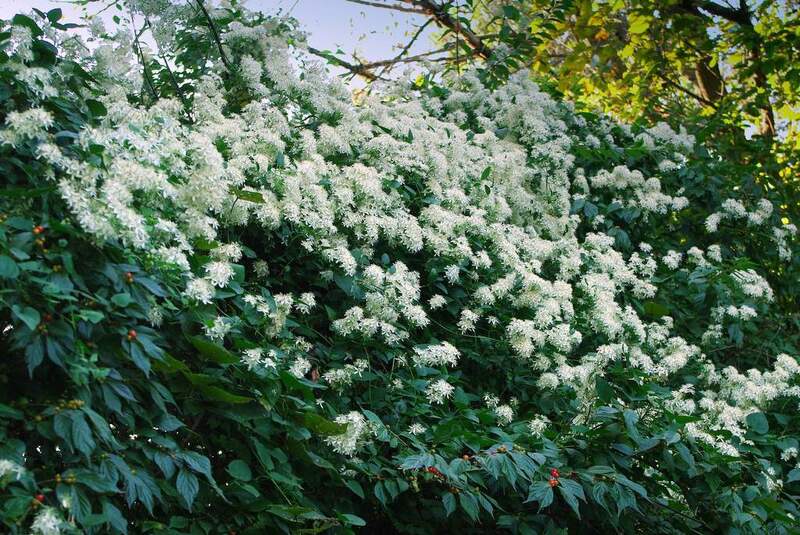 Not all "invasive" plants are invasive in all parts of the country, and I wouldn't call it invasive here in St. Louis. 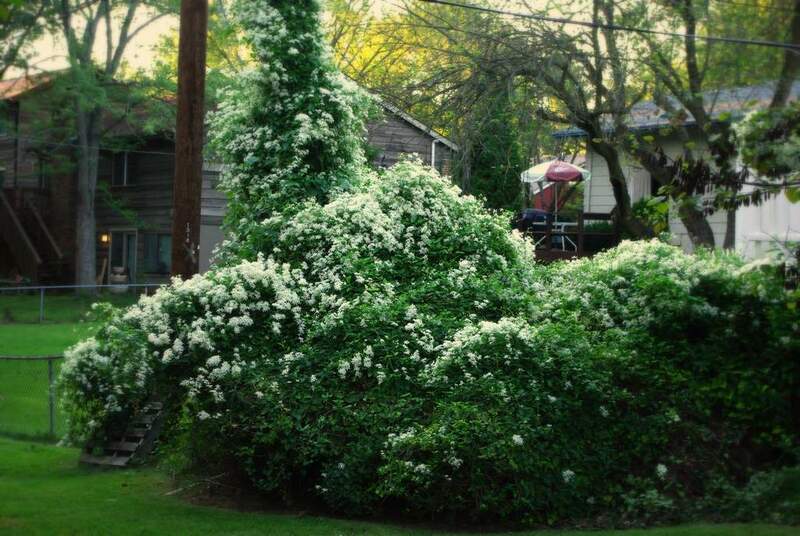 For instance, this vine has not taken over my yard, nor has it produced offspring elsewhere in my yard or in the adjacent yards. It has provided me with a great deal of pleasure each Autumn for years though, and in the end that's what is important to me in my garden.